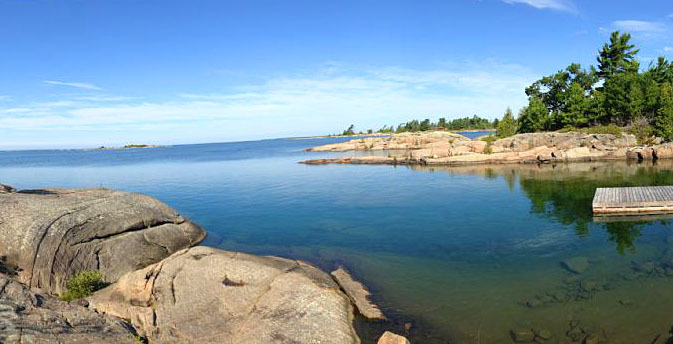 The shores and waterways of the Georgian Bay are the traditional domain of the Anishinaabeg First Nations peoples to the north and Huron-Petun (Wyandot) to the south. The bay was thus a major Algonquian-Huron trade route. Samuel de Champlain, the first European to explore and map the area in 1615–1616, called it "La Mer douce" (the calm sea), also a reference to the bay's freshwater. It was named "Georgian Bay" (after King George IV) by Lieutenant Henry Wolsey Bayfield of the Royal Navy in 1822. Georgian Bay is about 190 kilometres (120 mi) long by 80 kilometres (50 mi) wide. It covers approximately 15,000 square kilometres (5,800 sq mi), making it nearly 80% as large as Lake Ontario. Eastern Georgian Bay is part of the southern edge of the Canadian Shield, granite bedrock exposed by the glaciers at the end of the last ice age, about 11,000 years ago. The granite rock formations and windswept eastern white pine are characteristic of the islands and much of the shoreline of the bay. The rugged beauty of the area inspired landscapes by artists of the Group of Seven. The western part of the bay, from Collingwood north, and including Manitoulin, Drummond, Cockburn and St. Joseph islands, borders the Niagara Escarpment. Due to its size and narrowness of the straits joining it with the rest of Lake Huron, which is analogous to if not as pronounced as the separation of Lake Huron and Lake Michigan, Georgian Bay is sometimes called the "sixth Great Lake".